Cundill History Prize jury pushes the boundaries of history writing with finalists that are "Great Literature"
Three exceptional American historians – writing passionate, innovative works of history about new frontiers at times when the world was undergoing dramatic change – have been named as finalists for the world’s leading history prize, run by McGill University. Winning US$10,000 each, the three finalists are now in the running for the grand prize, which raises the reward for the winning author to US$75,000 – the largest prize for a work of non-fiction in English. 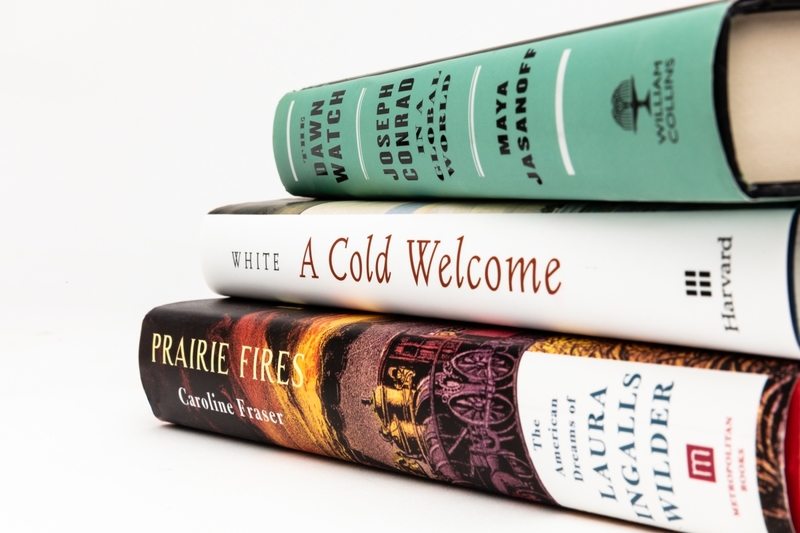 Caroline Fraser’s Prairie Fires: The American Dreams of Laura Ingalls Wilder, already a 2018 Pulitzer Prize Winner in Biography, is the first comprehensive historical account of the life of Laura Ingalls Wilder, author of the “Little House on the Prairie” books. Fraser takes on American mythology by looking at the settling of the American west through the lens of the life of one of the country’s most beloved authors. Spanning nearly a century of epochal change, from the Indian Wars to the Dust Bowl, Laura Ingalls Wilder’s dramatic life provides a unique perspective on American history. The Harvard Professor of History Maya Jasanoff, previously a finalist for the Cundill History Prize, blends history, biography and travelogue as she follows the routes and stories of Joseph Conrad for The Dawn Watch: Joseph Conrad in a Global World. Jasanoff presents the Polish-British writer as someone who embodied the issues of his turbulent time: migration, terrorism, the tensions between global capitalism and nationalism, the promise and peril of a communications revolution. The Dawn Watch embarks on a spellbinding expedition into the heart of Conrad’s world – and through it our own. With A Cold Welcome: The Little Ice Age and Europe’s Encounter with North America, the Ohio State University Associate Professor of History Sam White delivers an inter-disciplinary investigation into the decisive role the climate played in the success and failure of the first North American settlements. Evidence from climatology meets the written historical record to show how the severity and volatility of the period of climate change called The Little Ice Age threatened to freeze and starve out the Europeans. As the world confronts an uncertain future from global warming, this innovative history is a timely reminder of the risks of a changing and unfamiliar climate. Run by McGill University, the international Cundill History Prize honours the abiding vision of its founder, the McGill alumnus F. Peter Cundill: One of the most highly regarded global investors of his time, the globe-trotting philanthropist believed passionately in well-written works of history as the best foundation for a better informed public debate. The finalists were announced at an event at Massey College, Toronto. The winner will be revealed at the Cundill History Prize Gala in Montreal, on November 15, alongside a series of events at McGill University including the annual Cundill History Prize Lecture, which will be delivered by the British historian Daniel Beer, who won last year’s prize for The House of the Dead: Siberian Exile Under the Tsars, his groundbreaking study of Siberian penal colonies. Caroline Fraser is the editor of the Library of America edition of Laura Ingalls Wilder’s Little House books. She is the author of God’s Perfect Child: Living and Dying in the Christian Science Church, which was named one of the best books of the year by the New York Times Book Review and the Los Angeles Times Book Review, and of Rewilding the World: Dispatches from the Conservation Revolution. Fraser’s writing has appeared in The New York Review of Books, The New Yorker, The Atlantic, the Los Angeles Times, and the London Review of Books, among other publications. She holds a Ph.D. in English and American Literature and Language from Harvard University. Born in Seattle, Washington, Fraser currently lives in New Mexico. Maya Jasanoff is Coolidge Professor of History at Harvard University. Her first book, Edge of Empire, was awarded the 2005 Duff Cooper Prize and was a book of the year selection in numerous publications including the Economist, Guardian and Sunday Times. Her second, Liberty’s Exiles, won the National Book Critics Circle Award for Non-Fiction and was shortlisted for the 2011 Samuel Johnson Prize (now Baillie Gifford Prize). A 2013 Guggenheim Fellow, Jasanoff won the prestigious 2017 Windham-Campbell Prize for Non-Fiction. She was a finalist for the 2011 Cundill History Prize with Liberty’s Exiles: American Loyalists in the Revolutionary World. Sam White is associate professor of history at the Ohio State University and currently Norman Freehling Visiting Professor at the University of Michigan. He received his M.A. from the University of St. Andrews (Scotland) and Ph.D. from Columbia University. He is co-founder and director of the Climate History Network and steering committee member of the PAGES working group Climate Reconstruction and Impacts from the Archives of Societies (CRIAS). His other publications include The Climate of Rebellion in the Early Modern Ottoman Empire (Cambridge University Press, 2011) and The Palgrave Handbook of Climate History (Palgrave, 2018). He has received awards from the American Society for Environmental History, the Middle East Studies Association, the Agricultural History Society, and the Ohio Academy of History, among other organizations.